My previous sale post garnered one purchase and a few people who looked at things; so for this week only, I'll include shipping anywhere in the US free. Please excuse the quality of the pictures - the flash on my camera is making things look spotty. 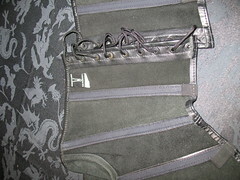 Both corsets are in excellent condition. http://alumiere.livejournal.com/351269.html#cutid1 has Lip Service, Pleasers, Icon, and OOAK clothing waiting for new homes. The silver corset? My natural waist is 28 inches. 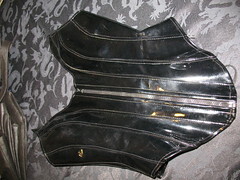 Not sure which one you mean by silver; Jenny (from pennsic) bought the Stormy leather piece which is black; the Naughty Lola is black vinyl and would fit you well - our waists are about the same, but you have more up top than I do. Thank you!! I will try that on the next post.